At the end of his deployment, Radwin worries that Dex will experience separation anxiety and will lick his paws until he get sores. “I go on with my life but he just sits and stares at four walls.” At the end of the film Radwin returns to be a father to his young daughter Ivy rather than re-enlist, acknowledging that because of Dex he is alive to carry on with his human family. “The Taliban will put a bounty on a dog’s head, so their prime target is the dog first and then the handler second.” Dog teams work off leash for the added safety of the handler and the troops they lead. “There is always a nervous factor – what if he turns a corner and he gets shot? What if he turns a corner and there are cattle and he decides to go chase it? What if he is all the way up there and he gets shot and we get pinned down, and I can’t get to him to save his life?” Throughout the year MWD Paco found 18 hidden explosives. Paco was hit and got two pieces of shrapnel in his right side. 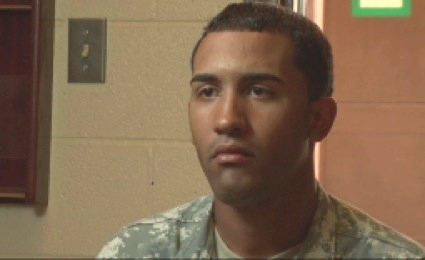 He received a purple heart for his sacrifice. An experienced MWD handler, SSgt Copeland must be able to read his dogs’ body language and behavior and to nurture an understanding between the pair usinglanguage that employs verbal commands, hand signals, body movement, and a keen perception of any signs that indicate danger for the dog or the unit. Soldier/handlers must be proficient as both combat soldiers and handlers, able to shoot back and protect themselves and their dog while clearing the route for those behind. "I am a Marine, Peter, from North Platte, Nebraska, says, “and it’s all about control. I have to learn to trust her, and let her do her job.” Since dogs are primarily searching for bombs to please their handler and be rewarded with a squeaky toy, he worries that his tendency to control Sita will distract her from her job to work off the leash and search independently. His relationship with Sita is beginning to change him in ways he could never anticipate, helping him understand the complexity of his relationship with his closest human companion, his wife. One of the most exciting aspects of filming hours of MWD training has been the opportunity to witness the special knowledge a great master trainer passes on to new handlers. 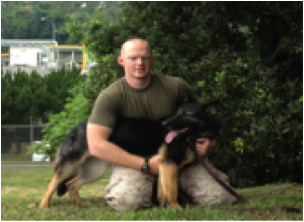 By following master trainer SSgt Joshua Miller we see what it takes to build a successful working dog team. Soft spoken when giving instructions and very precise when giving critiques at the end of a long exercises in bomb searching, SSgt Miller resembles more of a Zen master than a military officer. “A dog and a handler can definitely be in sync together, but there has to be a rapport. The dog is a part of me. When I have it on leash, it is kind of like the movie Avatar. I hook into that dog, and I figure out what he’s doing. And then we work together as a team. It’s a feeling of togetherness. The dog relies on me, and I rely on him. We need each other.” Miller has been working with dogs for 16 years. Danielle suffers from PTSD. Block, one of her MWD’s who led her to safety in war, is now poignantly her adopted dog leading her through the healing process. Danielle advocates strongly for giving MWDs a chance to retire and “just be dogs” in their final years.